Joel 2:30-31 And I will shew wonders in the heavens and in the earth, blood, and fire, and pillars of smoke. (31) The sun shall be turned into darkness, and the moon into blood, before the great and the terrible day of the LORD come. What are the Blood Moons? The modern four blood moons discovery took place in 2008 by Pastor Mark Biltz. He is an expert on all things Jewish. He had done extensive study on the subject of the Feasts of Israel. Well, at one point he was looking at the passages about the blood moon associated with the Day of the Lord and he thought about checking out when blood moons will occur by going to the NASA website. A blood moon is a lunar eclipse the creates a reddish color on the moon. On the NASA website they have a full schedule of all eclipses, both lunar and solar. He was looking at the dates and matching them up with the Jewish calendar and an amazing discovery came into visibility – blood moons occur on Jewish Feast Days on occasion. Then he realized that on extremely rare occasions four blood moons would happen on four Jewish Feasts Days within a two year time period! So it is obvious this is not just a random freak occurrence but a definite sign from God. Do the Blood Moons Mean Jesus is Returning Soon? Basically Pastor Mark Biltz was implying that the Lord may return on September 23, 2015 the Jewish Day of Atonement. For the person that believed in a pre-tribulation rapture, this was very exciting because all you need to do is count seven years prior and that would start the “Tribulation”, hence they were to be raptured around the Fall of 2008. Well, that came and went and we are still here so the pre-trib crowd dropped the whole subject. However, a pre-tribulational rapture is not found in Scriptures anyway – it is conjecture based entirely on allegory and symbols. There is not a single Scripture that says we are going to be raptured before the seven years….not one. Now that the Blood Moons have drawn closer, Pastor John Hagee has put out a book about the subject re-popularizing it once again. Hagee is pre-trib so now he implies that the Blood Moons may be signs associated with the rapture, i.e. the rapture will possibly occur during or before the blood moons. But there is no evidence in the Bible for this. However, the main point of the book is that the Blood Moons foretell the nation of Israel is about to go through a time of trouble then restoration based on the pattern of previous Blood Moon events. There may be some merit to this concept because the Bible teaches we are rapidly approaching the time of Jacob’s Trouble, known as the Great Tribulation, then the Lord Jesus returns (restoration). But we know the Great Tribulation is at least 3-and-a-half years away yet these Blood Moons are sooner. Maybe they are associated. Pastor Mark Biltz’s guess that the Lord would return on Yom Kippur 2015 must be wrong because that would mean we are currently in the Great Tribulation and we obviously are not. So what do the Blood Moons really mean? Rev 6:12-17 And I beheld when he had opened the sixth seal, and, lo, there was a great earthquake; and the sun became black as sackcloth of hair, and the moon became as blood; (13) And the stars of heaven fell unto the earth, even as a fig tree casteth her untimely figs, when she is shaken of a mighty wind. (14) And the heaven departed as a scroll when it is rolled together; and every mountain and island were moved out of their places. (15) And the kings of the earth, and the great men, and the rich men, and the chief captains, and the mighty men, and every bondman, and every free man, hid themselves in the dens and in the rocks of the mountains; (16) And said to the mountains and rocks, Fall on us, and hide us from the face of him that sitteth on the throne, and from the wrath of the Lamb: (17) For the great day of his wrath is come; and who shall be able to stand? Isa 13:9-11 Behold, the day of the LORD cometh, cruel both with wrath and fierce anger, to lay the land desolate: and he shall destroy the sinners thereof out of it. (10) For the stars of heaven and the constellations thereof shall not give their light: the sun shall be darkened in his going forth, and the moon shall not cause her light to shine. (11) And I will punish the world for their evil, and the wicked for their iniquity; and I will cause the arrogancy of the proud to cease, and will lay low the haughtiness of the terrible. Mat 24:29-31 Immediately after the tribulation of those days shall the sun be darkened, and the moon shall not give her light, and the stars shall fall from heaven, and the powers of the heavens shall be shaken: (30) And then shall appear the sign of the Son of man in heaven: and then shall all the tribes of the earth mourn, and they shall see the Son of man coming in the clouds of heaven with power and great glory. (31) And he shall send his angels with a great sound of a trumpet, and they shall gather together his elect from the four winds, from one end of heaven to the other. Notice there in Matthew 24 that the tribulation occurs then the sun goes dark and the moon doesn’t give her light. This passage is talking about that three-and-a-half year period called the Great Tribulation then a dark sun and darkened blood moon. We do not have three-and-a-half years before the Blood Moons of 2014/2015 end; therefore, the Blood Moons of 2014/2015 are not related to THE blood moon mentioned in the Bible at the Lord’s Coming. Something is about to happen to the nation of Israel. Exactly what, I do not know. But what I am watching for and expecting to happen next is the rebuilding of the Third Temple (2 Thess 2:4). Israel may be forced by the U.N. to give up land, the West Bank, to allow for a Palestinian state and for peace with the Palestinians (Dan 11:39; Joel 3:2), but Israel will not comply fully. The U.N. will try to force the 1967 borders with some land swaps. The Temple Mount , will be overseen by the U.N. (Rev. 11:1,2). This will be the last 7 years of Jewish captivity described by Dan 9:24 “Seventy weeks are determined upon thy people and upon thy holy city, to finish the transgression.” The holy city is Jerusalem overseen by the U.N. This will be a Jewish captivity that will last until Jesus returns and we WILL be here to witness the whole thing. 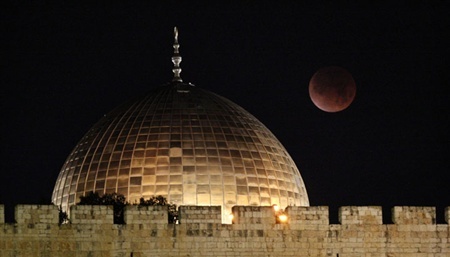 The sign of the Blood Moons do accomplish two things; one, we will be watching the nation of Israel more closely and two, we will be watching the skies more closely. Jesus told us there would be signs in the sky just prior to His return (Luke 21:25; Joel 2:30) and they are coming. Church, it is time to be ready for the beginning of the seven years! The first three-and-a-half will be relatively peaceful (except for Jews living in the West Bank), contrary to what Pre-Trib doctrine teaches. But then starts the Great Tribulation which will last 1260 days. At the end of it, we will be raptured before the wrath of God is poured upon the earth at Armageddon. He is coming soon; are you ready? Isa 24:21-23 And it shall come to pass in that day, that the LORD shall punish the host of the high ones that are on high, and the kings of the earth upon the earth. (22) And they shall be gathered together, as prisoners are gathered in the pit, and shall be shut up in the prison, and after many days shall they be visited. (23) Then the moon shall be confounded, and the sun ashamed, when the LORD of hosts shall reign in mount Zion, and in Jerusalem, and before his ancients gloriously. Mar 13:24-27 But in those days, after that tribulation, the sun shall be darkened, and the moon shall not give her light, (25) And the stars of heaven shall fall, and the powers that are in heaven shall be shaken. (26) And then shall they see the Son of man coming in the clouds with great power and glory. (27) And then shall he send his angels, and shall gather together his elect from the four winds, from the uttermost part of the earth to the uttermost part of heaven. Luk 21:25-28 And there shall be signs in the sun, and in the moon, and in the stars; and upon the earth distress of nations, with perplexity; the sea and the waves roaring; (26) Men’s hearts failing them for fear, and for looking after those things which are coming on the earth: for the powers of heaven shall be shaken. (27) And then shall they see the Son of man coming in a cloud with power and great glory. (28) And when these things begin to come to pass, then look up, and lift up your heads; for your redemption draweth nigh. RELATED: Blood Moons Symmetry – Special Date January 5, 2015? Netanyahu was just reelected, which means the chances for peace talks with Palestinian leaders, much less a 7-year peace treaty and a Palestinian State, are nil. What does it matter? If God is mad at me I know His love has to be stronger than any love I have felt for any one of my children and their children. I would do anything to help them. Including forgiving them unconditionally just because I love them. I am that I am that I! I love therefore I am. I am because I have felt love and given love from an unconditional stand point. Do you think our Creator our Mother/Father God is capable anything less or is it anything more than who we are? Who are we really? It matters because if you haven’t accepted God completely into your life then you know you need to get your crap together! Down here how we look at sins is so far away from how God looks at them. In God’s eyes lying is equal to murder, that doesn’t make it right for us to do down here of course. We treat it like God isn’t coming ever in our life time, but that might not be true.